Our members are offered to participate in FREE group lessons (maximum 5 students for a teacher in a lesson). Log in and go to ‘Reserve a Group Lesson’ to participate. It is on a first-come-first-served basis and we will start taking reservations from 7 am on the lesson day (Japan time). We will specify an English level or a general qualification to participate in each group lesson so that many members can try it. Be logged in your Skype account 5 minutes before the starting time. A teacher will call students. This lesson will be more relaxing than a one-on-one lesson. Just try it and maybe you can find a good rival to further improve yourself. * If there are no openings left, it is not possible to take the lesson. * Depending on the internet connections, you may find difficult to listen to others. 2. ‘Quote of the Day’ and ‘Practical English’. 'Quote of the Day' and 'Practical English' are updated every day. If you like the phrase, memorize it and use it during a lesson. You will probably get a good laugh by quoting it (thanks, Woody Allen). Then think about another phrase you can actually use in your work place and etc. Here is an example using ‘the decision maker’. My uncle was arrested for drunk driving and was sentenced to 1 week community service. His sentence was a slap on the wrist.. Sometimes you may find it difficult to continue learning. You can write your weekly goal and choose the degree of achievement from 0% to 100%. Try to set an achievable goal and that will motivate you to keep learning. All of your weekly goals are saved. You may be able to find more effective way of learning by looking back these records. 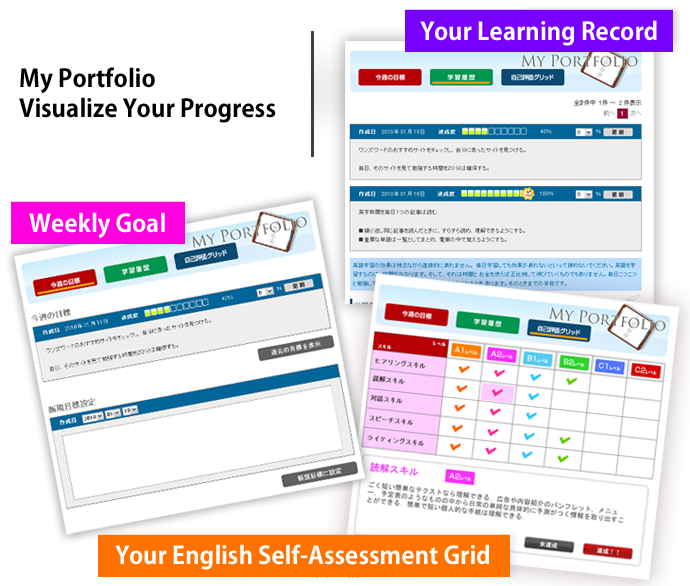 If you organize your study by setting a goal and recording a result, you can believe that your English will improve even if you are a little bit tired of studying. 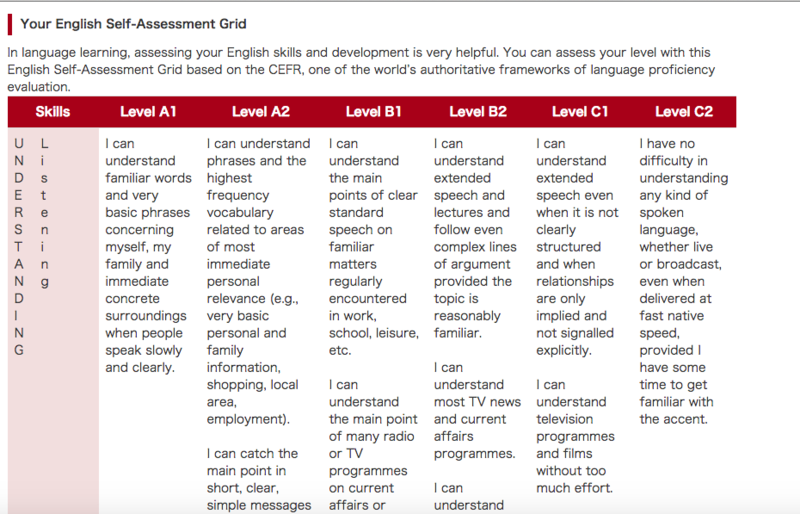 Evaluate your English skills with 'Your English Self-Assessment Grid' based on the CEFR. It will clearly show what you can do in English. That will help you create your study plan and find the best learning style in consultation with your teacher. 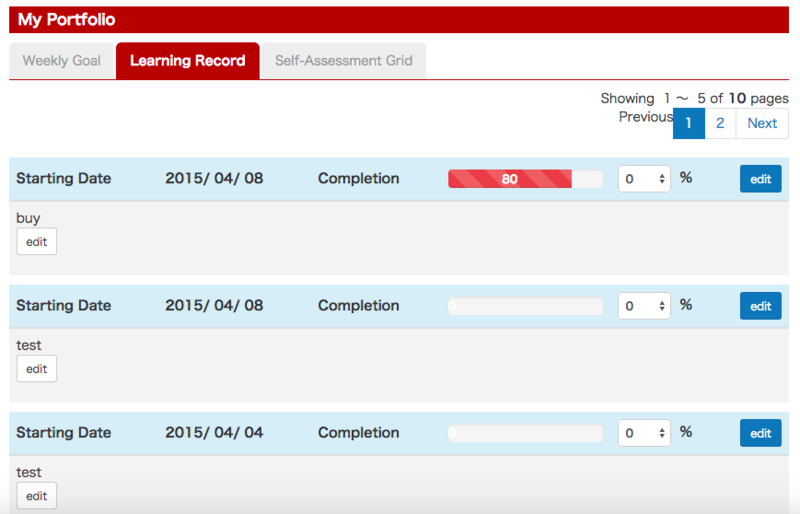 You can see the sample of 'Your English Self-Assessment Grid' here. We have meet-ups and parties where you can meet other members and share your learning experience. Don't miss our useful contents; they can be added anytime soon.